Millions of Americans have switched from old appliances to new, energy-efficient models, egged on by $300 million in rebates being offered by all 50 states in last year's economic stimulus package. But the new machines have some basic differences from their predecessors, notes "Early Show" Consumer Correspondent Susan Koeppen, so using them properly to get the best out of them differs, as well. A shocker -- don't rinse your dishes! Scrape them, but don't rinse them. It wastes water, and the dishwasher actually works better when it senses dirty dishes. You'll get a better wash if you don't rinse them clean before putting them inside. And less is more when it comes to soap. Too much can cause the cycle to run longer. It can also leave a residue. Use a rinse aid for best results. As for loading: Large items should go in the back and sides, with dirty dishes facing the center of the machine. Load silverware handles down -- except knives. Mix up spoons and forks so they don't stick together. If the dishwasher develops a musty smell, put a cup of vinegar in the top rack and run a full cycle. 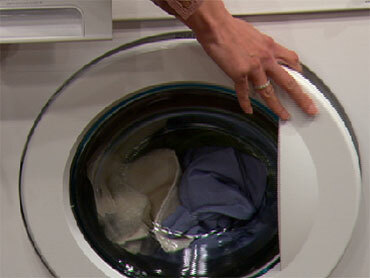 Switching to an Energy Star high-efficiency washer can save you 5,000 gallons of water a year. These machines are using less water, yet have more space for you to put clothes. But don't overload the machine. Make sure you can close the door easily. If you can't, you have too much in it. Again, less is more for soap. Some experts say all you need in the new front loaders is a tablespoon of detergent. Too many suds is not good and will not make clothes cleaner. Something else new here: the "overflow trap." It's where all those paper clips and lipsticks and other items you forget in your pocket will go. Clean it out. Moldy smells can be a problem with these, too. You want to wipe down the ring after every use. You can also run an empty cycle once a month with a cup of bleach. Clean the filter before or after every use. That's very important. Also, every six months, clean the filter with a nylon brush and some warm soapy water. Go easy on dryer sheets. Less is more! They can build up residue in your machine. If you notice your drying time increasing, make sure you clean out the vents -- they could be blocked with lint. If you don't know how, hire a professional. It varies by state. Some have used up their allotments, while others have some left. Some of the information was provided by the National Kitchen and Bath Association, the Associatino of Home Appliance Manufacturers, and by VernonSchmidt@refrigdoc.com.